A significant new multi pitch line in the Western Dihedrals. With the exception of Crap Crags, this is the easiest free route to breach the West Face of the Chief. That said, it is very sustained at 5.10, harder than Angels Crest but easier than the Grand. Pitch 4, 5.10c, rattly fingers in a flare. 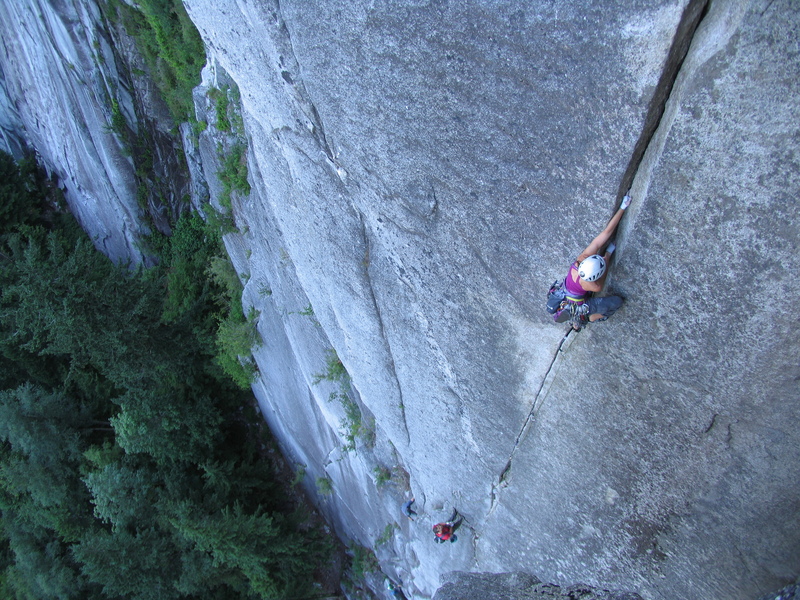 Sunset Strip utilizes sections of other climbs, Sticky Fingers, Millennium Falcon, Crap Crags, and The Gauntlet, with about 70% new terrain to create a very direct and interesting line up the Chief. The route has 12 pitches, several pitches can be linked and it is likely that many teams will repeat the route in 9 or 10 pitches. That said, the shorter pitches take advantage of good belay stances, decrease rope drag, and will reduce the size of rack required. The route is very well protected with several bolts added to the previously bold upper sections of The Gauntlet. Being located in the Western Dihedrals the route will be subject to annual peregrine falcon closures, although in 2013 there is no such closure in effect. Hands and fists, up high on pitch 10, 5.10a. Belays are all fixed and rappel anchors are installed to the top of pitch 7. 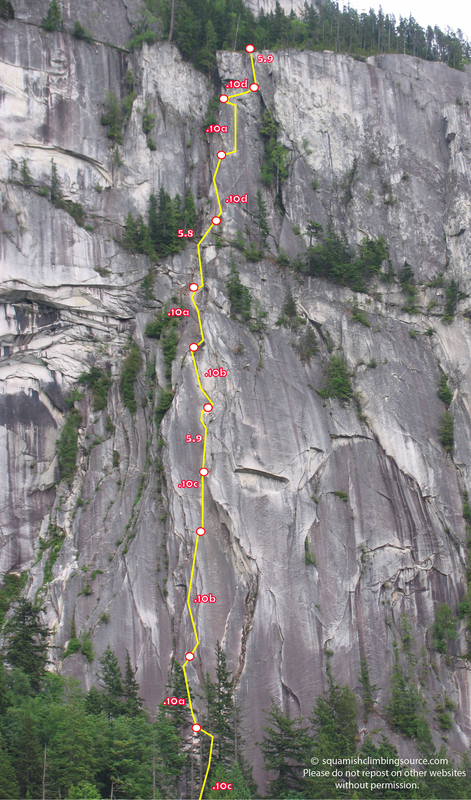 The route can be rappelled from pitch 7 down with one 60m rope. From the top of pitch 3 the single rope rappel line is down to the right towards the Gauntlet and will require a bit of route finding and care to make it work. 5.10c. Sticky Fingers. Step off fortuitously lodged boulder onto a desperate slab move past a new bolt. Follow right leaning thin finger cracks until possible to escape left onto large ledge system. 35m. Photo topo – click to enlarge for detail. 5.10a. Layback the edge of a wide corner past two bolts. Continue up fun chimney (end of p.1 of Millennium Falcon) to a belay atop a small tower. 18m. 5.10b. Two variations at the start provide the crux, the right hand being slightly easier. Beautiful and continuous finger cracks linking several left facing corners pull out to the right to a stance on the open slabs, (this is p. 2 of Millennium Falcon). 40m. 5.10c. Climb the finger crack straight up into an off fingers flare, cruxy moves around a bulge to small stance at the base of “box” corner feature. 18m. 5.9. Climb up the box corner, passing blocky roofs on the left. 20m. 5.10b. Step right into short flare feature, exit the flare by laybacking leaning corner, easier climbing leads to a large belay ledge. 20m. 5.10a. 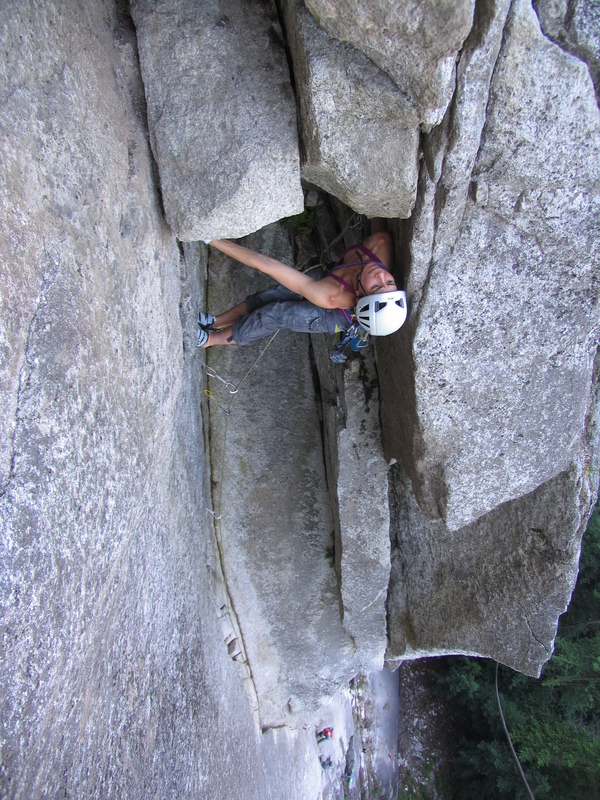 Climb past bolt to left facing corners, an aesthetic undercling leads to small belay stance. 20m. The 5.8 chimney pitch of Millennium Falcon is just to the right. 5.8. Left facing corners give way to broken, low 5th class ramps, follow right trending ramp to its end. (The upper part of this pitch is Crap Crags). 30m. 5.10d. Face climb past 5 bolts to an exciting left facing corner. Continue up easier grooves taking care not to miss the belay stance out right on the arete. (This is pitch 8 of the Gauntlet). 25m. 5.10a. Traverse right from the belay to access excellent hand/fist crack on the basalt infused headwall. The belay anchor is hidden from view on a small ledge to the left. 25m. 5.10d. Traverse right in a wild position, face climbing and gravelly underclings lead to a short, steep crux. Fully bolt protected. 15m. 5.9. Steep and exposed chimneying, finishing with a short squeezer. Entirely fixed with 4 bolts and one piton. (this is the last half p.10 of The Gauntlet). 15m. The box corner, pitch 5, 5.9. This pitch links well with pitch 4. Rack: A single set of cams to #4 BD and nuts, 2 X .3, .4, .5, and .75 BD, should be enough for most people. Awesome! Congratulations to the brave climber! This was an awesome climb. Kudos to the folks that cleaned this route and outfitted it. I think the beta should note on pitch 7 that millenium falcon chimney is to your left if I’m not mistaken. Also, I’d like to note that the crux of pitch 4 has a bolt as well as the very wide portion of pitch 10 has 2 nicely placed bolts. A very nice addition to a quality and challenging outing. There is a 2 bolt anchor at the end of the last .10a pitch it is off to the left at good stance, it would be easy to miss if you decided to link into the next pitch. Before the bolt was placed in the block I hammered on it and got a large pry bar behind it, in my mind it was not only solid but also geometrically “keyed in” to the surrounding solid rock, with a lack of good alternate locations I thought this placement was fine. I do agree that if a fall onto this bolt dislodged this block, it would be catastrophic. I suppose folks can make up there own mind whether or not to clip this bolt. I have received a number of comments about the first bolt of the final chimney being hard and committing to clip, especially for shorter climber. I would be totally happy if someone wanted to lower the bolt placement as long as they did a good job of erasing the original first bolt, I generally over drill all my bolts so if a placement needs to change the nut and hanger can be removed and the stud can be tapped in flush and the hole patched. I’m glad you liked the route, I am happy with how well received it has been and that it is at an approachable enough grade that we will still be able to climb it when we are old men! When I climbed it and topped out after the wide 10a crack (does the pitch have a name? ), I couldn’t see the belay station above the route, but looking to the left, I saw the chopped tree stump and knew it was the obvious, comfortable, and ideal spot for the belay anchor! 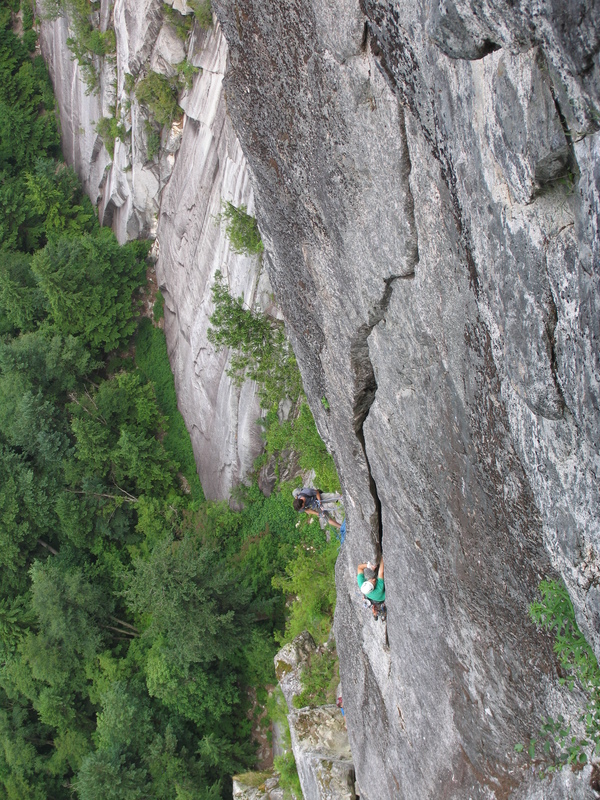 Amazing route, every pitch is banger!